After a long, cold winter felt throughout the country, the first day of spring is something many are looking forward to. 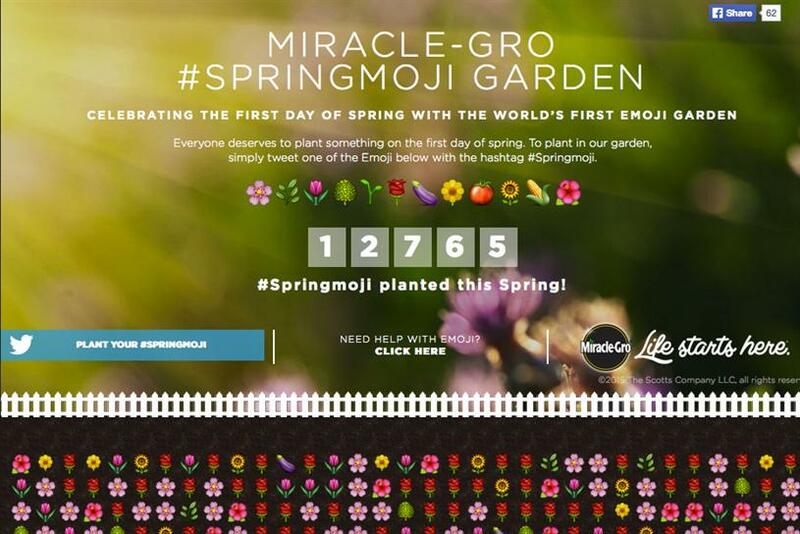 To celebrate spring, Miracle-Gro is inviting growers everywhere to reconnect with their garden via @Miraclegro and the first-of-its-kind crowdsourced #springmoji garden. 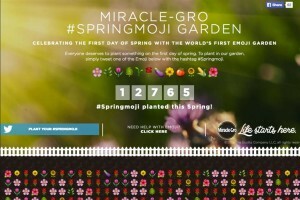 Beginning March 20, the brand will plant the world’s biggest digital garden using custom code from the hugely popular emojitracker.com. To bring the garden to life, Miracle-Gro and its agency 360i formed an exclusive partnership with renowned developer mroth (Matthew Rothenberg) of emojitracker. Every time a new plant-based emoji is used on Twitter, Miracle-Gro will ‘plant’ an emoji in its digital garden, building the world’s first global community garden to inspire millennial, urban consumers to begin growing. To participate, tweet one of 12 spring garden Emoji, or #springmoji, and watch them grow here (site goes live 3/20/15 at sunrise east coast time).